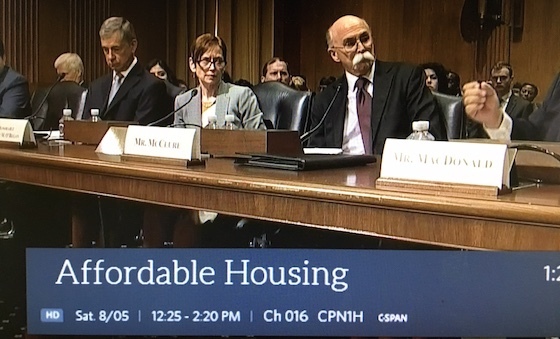 We were shocked the other day to see a Congressional hearing on affordable housing on C-Span. Only 20 years ago, you could not get that topic on TV if you bought ads on the Super Bowl, but suddenly it’s the talk of the town. Was C-Span just trying to fill air time? No, the truth is that the U.S. has finally woken up to the fact that a huge number of Americans can no longer afford to put a roof over their heads. Except for those lucky folks that made it into the Section 8 program (remember that 75% of those that need such assistance are turned away due to lack of government funds) the rest are left to make do with a median U.S. home price of around $200,000 and an average apartment rent of around $1,200 per month. On top of that, Section 8 is not even a real fix, as it requires subsidies, so you are not really solving affordable housing but simply passing the burden from the customer to the U.S. taxpayer. In order to solve affordable housing, you have to actually produce inexpensive housing. About 80% of those who live in our mobile home parks do so with an out-of-pocket cost of around $300 per month or so, as they own their home free and clear, or buy it for small cash amounts like $2,000 or so. So the big question is: when will we actually see positive commentary on the mobile home park on television, and finally break the negative spell of Trailer Park Boys, Myrtle Manor, COPS and 8-Mile? It’s coming pretty soon. When Is An RV An RV? This is a photo of an RV in one of our mobile home parks in Kansas City. It’s becoming a more common sight in mobile home parks these days, as many Baby Boomers are choosing to retire into mobile home parks with their RVs, as opposed to buying a mobile home. They do this because it’s often better built, or because they prefer the finish-out, or because it has no negative stigma. But the problem, for the park owner, is the simple fact that an RV has no barrier to moving out, unlike a mobile home. Yet this resident has already lived in the Kansas City park for years, and may live there for the remainder of their lives. So when is an RV an RV, and when is an RV more like a traditional mobile home? The first item that most buyers look for is simply who pays the electricity and/or water bill for the lot. The theory is that an “overnighter” type of RV occupant would never commit to going down to the utility company and signing up for a monthly account. To promote this type of customer, many mobile home park owners are only renting RV lots by the month rather the night, so that those who are not committed to a long-term tenancy are eliminated. In many states, the customer is required to be given the option of a 12-month lease. Any RV occupant who signs a lease – probably of any length – is not your typical overnighter tenant. So the length of lease is a solid display of the commitment of the RV owner to staying for more than a day or week. How long have they already been there? Past performance is often a great indicator of the future. If the resident has lived in their RV on that lot for two years, then they clearly have the intent of living there for the long term. Smart buyers look down the rent roll for length of tenancy as an important step to evaluating the direction that most RV owners will be taking. Our experience has been that RVs that have been skirted virtually never leave the park – almost in keeping with a standard mobile home resident. Clearly, if the tenant had any inclination to move, they would never take the time, effort or destruction to their RV in order to put skirting on it. It’s also interesting to note that a skirted RV looks very similar to a pre-HUD mobile home. They should, since mobile homes and RVs were the same thing until the late 1950s. Has there been any demonstration of pride of ownership in the lot itself? Equally as important as skirting are any capital-intensive additions that the resident has added to their lot that would demonstrate the desire to live there for the long term. Such fixtures would include carports, landscaping, firepits and heavy outdoor furniture. Real overnighter RV customers never bring with them anything that won’t fit in their RV or car, and a metal carport means a $1,000+ investment that will have to be left behind. RVs are becoming a more common item in mobile home parks throughout the U.S., as roughly 10,000 Baby Boomers retire each day, with many selecting downsizing to an RV instead of a mobile home, and then placing it inside a mobile home park. While that’s a definite megatrend, it poses issues for the mobile home park buyer to mitigate their risk of an RV customer that can pull out at any time. However, an RV, properly vetted, may be just as reliable as a mobile home client. The last decade has ushered in frequent flooding in many parts of America. Whether or not you believe in “Global Warming”, the change in weather patterns has brought about significantly more rain in certain parts of the U.S., and has raised the danger of flooding in many communities. While high water is never a good thing unless you are trying to fill a man-made lake, it does not have to necessarily spell doom for your mobile home park, thanks to those natural defenses that most mobile home parks inherently have. One of the greatest anti-flooding defenses that mobile homes wield is the simple fact that they are already up on stilts – typically about 3’ to 4’ off the ground. This simply fact gives them a huge advantage over all other types of housing. We had a park in Missouri a couple years in which the entire section of the city flooded. They had to evacuate the town. When the water receded, we were the only ones that were unhurt – the single-family and multi-family structures were all ruined. As long as the water does not reach the floor of the home, it mostly passes underneath and damage is minimal. On that note, water pressure is greatly reduced since it can flow under the home, without pushing on its sides. You’ve probably seen videos of stick-built homes that get toppled by water pushing on them horizontally, but mobile homes avoid this risk, as well. Since the mobile home is anchored to the ground as a defense against high winds, it can survive almost indefinitely any form of flood current. We have found that most mobile home park developers took precautions a half-century ago to not place the actual mobile home lots in harm’s way. Even though they have floodplain designation, most owners were smart enough to only put playgrounds and common areas in the actual flood zone. As a result, you need to compare the topo map to see where he actual flooding in a mobile home park would occur – because often the risk has already been mitigated. Flood plain designation is never a good thing for any mobile home park. However, it does not have to be deal killer. Mobile homes have some inherent natural defenses that can keep you out of trouble even when the waters rise. Have You Listened To Our New Podcast, "Mobile Home Park Mastery", Yet? We had thought about doing a podcast series for years, but we were afraid we’d run out of interesting material. However, all the new developments in the industry have opened up a large number of interesting topics, from “Duty so Serve” to “industry consolidation”. So we’ve launched our own podcast series entitled “Mobile Home Park Mastery” which will include interviews, headline news, and honest discussions of the hot topics that all community owners and buyers would be interested in. For ease of access we are hosting the show on several platforms. Be sure to subscribe on your favorite platform below! To celebrate the launch of Mobile Home Park Mastery, we created a book to accompany it entitled "The Top 20 Biggest Pitfalls To Avoid When Buying a Mobile Home Park". And you can get this book for FREE. All you have to do is subscribe to the show above, leave a review, and send a screenshot or link to you're review to [email protected] And as a special bonus, we will enter you into a drawing to win 1 of 3 Ricoh Theta 360° cameras. It’s a fact that one of the largest industries in the U.S. is fast food. Those restaurants that you see at every highway interchange and along busy corridors are a big part of the U.S. economy and one that shows little signs of decline. And that’s great for mobile home parks. So why is the fact that we’ve become a “fast food nation” a great thing? First, let’s get a handle on just how big an industry fast food is. Since 2007, it has been the fastest-growing industry in the U.S. It employs nearly 4 million people. It serves 50 million meals per day. It has become a huge staple of the American diet, offering an affordable alternative to cooking for millions of Americans on the go, or simply unable to afford other options. If you look around the typical mobile home park, you will find that more residents work in fast food than probably any other employment sector. In short, fast food is a gigantic part of the American landscape. We are seeing changes in the car industry in which the internal combustion engine is being challenged by the electric motor. We’ve seen the radio industry destroyed by iPod, and the letter destroyed by email. We live in an era of sudden innovation that renders the old guard obsolete or undesirable. However, there is no risk of this occurrence in fast food. That’s not to say that there’s not shifts in consumer tastes. But when you convert that Kentucky Fried Chicken building into a Chipotle, it still provides the same jobs only with different uniforms. Because fast food workers endure lower pay and strange hours – as well as little chance for advancement or mental stimulation – there are always more jobs than applicants. This is important for mobile home park residents because it’s a great backstop to their income and careers. If they lose their higher paying job at Jiffy Lube, they can always retreat back to Taco Bell seamlessly. This allows mobile home park residents to have nearly perfect employment, as they can literally lost their job in the morning and start a new paycheck by the afternoon. The reality of a modern America is that a day-job only does not always pay the bills. The good news is that there are a multitude of part-time employment opportunities in the fast food sector. And there are day shifts, night shifts, and weekend shifts available. When the mobile home park tenant need to earn extra money to buy something they want or just stay ahead on their bills, that option is always available, without any damage to their day jobs. Since fast food work is among the most unskilled in the U.S., it’s a good thing that there are minimum wage laws. Without them, it’s possible that employers would use their collective strength to drive wages significantly down and that would make the earnings of fast food workers highly elastic. Instead, there’s no way a fast food worker can earn less than $7.25 an hour, and that’s a minimum full-time wage of around $14,500 per year. That’s the sweet spot for most mobile home park required earnings to afford the lot rent and/or home payment, as well as utilities and other costs. The average U.S. lot rent is $285 per month, which is almost exactly the 30% of gross wages threshold that the American government recommends for housing costs. Although it’s not much talked about, there actually is upward mobility for fast food workers – if they have ambition and work hard. Advancement can include becoming an assistant-manager, a manager, a district manager, and even a franchisee. Unlike the typical retail worker who has no educational level that would lead to the role of a buyer or retail executive, the fast-food industry is fairly egalitarian and relies on performance and not college degrees. Remember that McDonald’s has its own college called “Hamburger U” and it doesn’t care about your high school GPA or ACT score – it only cares about cooking fries and preparing that burger. Of all the industries to dominate the U.S. landscape, it’s great news for mobile home park owners that it’s the fast food industry. For yacht manufacturers, not so good news. 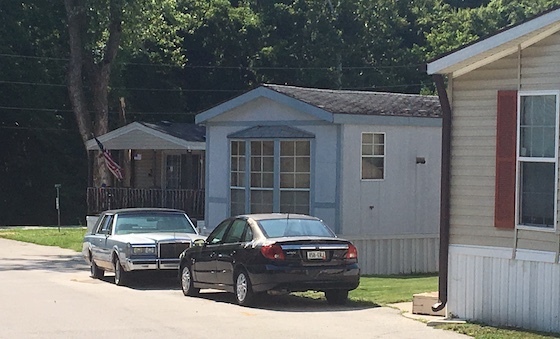 While most mobile home parks have a parking plan that involves the residents parking on 20’ x 20’ pads on each lot, other parks have the infrastructure for the residents to park on the street, parallel to the curb. This “on-street” parking is found mostly in properties from the 1960s and 1970s, traditionally built under the HUD programs of development financing, in which the government wanted to promote the “feel” of parks more as subdivisions than “trailer parks”. And these parking plans are perfectly fine, as long as you understand some of the issues. “On-street” parking is an actual design feature, not to be confused with un-planned convenience. Real “on-street” parking is immediately visible due to extra wide streets that allow for two unobstructed lanes of travel and one or two lanes of parking. This is identical to a city street. However, some park owners claim to have “on-street” parking when, in actuality, all that’s really happening is that residents are parking on a normal street and blocking one lane of travel. While real on-street parking is perfectly successful, meets code, and will offer no pushback from cities or lenders, fake on-street parking is not a real parking plan, and can result in illiquidity and fines. How many cars will they accommodate vs. needed spaces? One frequent problem with on-street parking is the number of available spaces vs. the number that are actually needed to meet the demands of the residents. With the typical automobile requiring 20’ of length, to have two cars requires at least a 40’ wide lot, which is not the case in all parks. In properties where most residents have one or two cars, these on-street systems work well, but tend to fall apart when residents have two or three cars each. When spaces are missing, residents tend to do things like park in their yard, which results in torn-up landscaping, stretches of mud, and resulting aesthetic concerns. If the on-street parking plan is not working, you will need to add additional guest parking areas in unused portions of the properties to allow for the ability to safely park all vehicles in a controlled manner. If your park is not actually designed for on-street parking – and the tenants use it anyway – you may soon get a call or letter from the Fire Marshal or city inspector with a violation notice and fine. You have to maintain the ability to get an emergency vehicle down the street at all times, whether it’s convenient for you or not. Many parks can get away for years with illegal parking, only to be caught when there’s a 911 call to the park and the ambulance or fire truck can’t get through. Such an ending can also create liability for the park owner, so you have to take control of the situation. You should definitely mark all streets as a fire land and no parking signs if they are not designed for on-street parking and yet tenants are starting to abuse this. Should you stripe actual spaces? In addition to Fire Lane striping, some park owners also stripe the actual on-street spaces. There are two schools of argument for this. Some owners say that having such spots marked makes it easier for residents to follow the original parking plan and even assign spaces. Others say that it creates further problems as small cars don’t need as large a space as a full-size model, and when you do such striping you effectively reduce the number of potential spaces. You find both systems on city streets, so it’s probably a matter of taste. If your park simply does not have enough parking for the number of cars contained therein, remember that you can also buy or rent some land next door for this same purpose. Although mobile homes are not allowed to hang over into the neighbor’s land, the same is not true of cars. Some park owners have their overflow parking lots located next door to the park, and it still works fine. On-street parking is a perfectly fine system. It’s common on city streets across America. But there are some issues with it concerning mobile home parks, and the smart owner knows these potential problems and proactively stays ahead of them. Many historians believe Winston Churchill to be a perfect example of one of the great strategists of World War II. He knew how to get the U.S. to participate in the war, where to allocate troops effectively, and how to maintain public morale. While your mobile home park acquisition plan may seem less important than salvation of the free world, it requires just as much advanced planning, and a great plan typically leads to great results. So how do you use effective planning in buying a mobile home park to buy? The first step is to get a handle on what size mobile home park you should be targeting. Generally, this is five times the amount of your down payment. If you have $100,000 to invest, then you would be looking at roughly $500,000 parks (assuming roughly 20% down payment). Of course, that’s not to say that you can’t find deals for 10% down or even 0% down if you look hard enough (remember that we have done around twelve “zero down” deals to date) – or even deal assignments -- but it gives you a rough guideline so you don’t waste your time looking at deals that are too large (or too small) for your purposes. For most people, the standard initial territory for buying parks is about 4 to 5 hours from their home. This allows them to drive to the park on a Saturday morning, spend a few hours, and be back in time for dinner. While it’s true that you can manage parks from very long distances, most people feel “out of control” if they can’t drive to their park. We are no different, with Frank’s park being 15 minutes from his house, and Dave’s first park one that he moved into in order to learn how to manage it. But we’ve learned over the past 20 years that there really is no need to be anywhere near your mobile home park – it’s all mental. But we would urge you to not limit yourself to just a 10 mile radius from your house. A 4 to 5 hour radius allows you to cast a larger enough net to find a decent volume or properties to consider, and volume is everything in finding the right property. That’s right, volume is probably the most important contributor to success, as long as you know how to properly evaluate the deals in your funnel. If you give a monkey an infinite number of attempts to throw a tennis ball into a coffee can at 50 yards, they will eventually make one. Smart strategists realize this essential commandment, and work to maximize their deal flow by working brokers, on-line listings, cold calling and direct mail all at one time. There’s no reason to hold back. Did you see the movie “Dunkirk” recently? It’s the perfect example of the necessity of learning at all times. The same group that failed miserably at Dunkirk ending up winning World War II. They saw their failings as educational opportunities, and they only made them smarter. If your pitch to the mom and pop seller didn’t work as you hoped, then try a new one. If it worked great, try to perfect it even further. We are learning new things every day about buying parks, even after 20 straight years of doing so. In Sam Zell’s new book “Am I Being Too Subtle” he discusses his basic rule to risk, which is simply “if the risk is low and the reward high, buy it, and if the risk is high and the reward low, never buy it”. We couldn’t agree more, and even Churchill would nod in approval. A good mobile home park strategist seeks out those deals that have the correct components and pricing. That means knowing the correct way to value and perform due diligence on a mobile home park. But it also means staying constantly vigilant for opportunities that meet this metric. 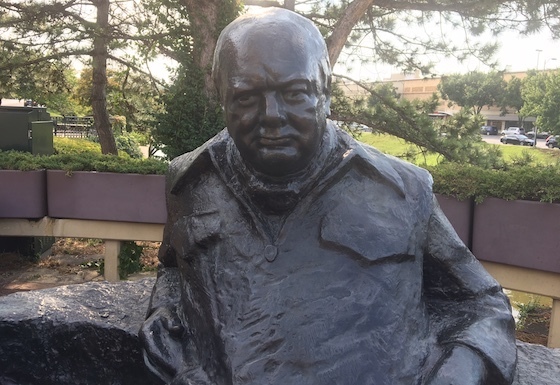 Churchill overcame enormous odds to win World War II using smart strategy. You can win your battle to find the right mobile home park to buy using that same tool. Well, we’ve been predicting for years that the government would eventually have to get active in the affordable housing sphere, and we’ve been proven correct. But where does this debate now go, and what is the government getting right and wrong about the problem and the solutions? This is one of the biggest topics in the industry in the near term, and worthy of discussion. Despite their failures in other sectors, the government is definitely going in the right direction in several ways regarding affordable housing. Admitting that there is a problem is a great start. For years, the government has swept the issue under the rug, and kicked the can until the label fell off. It’s refreshing to see that they are finally owning up to the problem and discussing how to solve it. H.R. 3700, which passed last year, allows Section 8 recipients to use their vouchers to purchase mobile homes. This unprecedented move from the status quo of creating generational renters may be a gamechanger for mobile home parks in blighted areas. It will bring millions of potential customers into the industry and our bet is that they will much prefer a home and a yard to a rental space and is a win/win/win for consumers, park owners, and taxpayers who will actually see Section 8 contributions go down as more people own their home and simply pay lot rent (which averages only around $285 per month vs. average apartment rents over $1,000). Fannie Mae and Freddie Mac have brought out exciting loan offerings for mobile home park buyers and owners, with more attractive terms than traditional CMBS lenders in many cases. This is again a win/win/win as it benefits community owners, creates solid loans at good interest rates for Fannie and Freddie, and helps community residents keep their properties free of re-development (since the lack of funding to buy and refinance mobile home parks would simply force those properties into a different use that has easier financing availability). This is the FHFA (Federal Housing Finance Agency) saying that “we’re here to serve the needs of all Americans – not simply the more affluent”, and directing Fannie and Freddie to proactively support the mortgage needs of manufactured homes. The realization by the Federal government of the need to support true affordable housing (as opposed to “subsidized” affordable housing) is a huge first step that we believe will ultimately lead to mobile home buyers being able to get loans to buy new homes with the same ease that stick-built buyers have enjoyed for decades. The introduction of a bill entitled the “Manufactured Housing Community Sustainability Act” by U.S. Senator Jeanne Shaheen (D-NH) and Rep. Keith Ellison (D-MN) would offer tax credits to those park owners who sell to the residents, to ensure the property does not change its use. It’s a very creative take on a tough issue, and these are the kind of win/win ideas that can be game changers for thousands of community residents. While the government is getting much correct, there are still problems in some of the concepts and planning that they are undertaking. We watched a C-Span broadcast of a debate in Congress on the affordable housing crisis in America, and not one member of the manufactured home community was present. In one part of the discussion, a panel member talked about the various forms of affordable housing, but did not even mention our industry. It’s crazy that there is not greater representation of the mobile home park sector in such discussions. The government has to admit that the apartment industry’s role in affordable housing – built on tax credits and subsidies – is not sustainable. 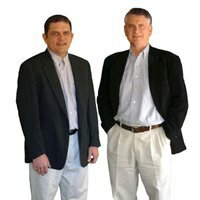 We know that the “swamp” in D.C. is full of apartment lobbyists, but even the C-Span broadcast included a Congressman wanting to know why there have apparently been apartment owners that have built affordable multi-family with tax credits and subsidies and, when the market grows stronger, bankrupting their own entities to end the affordable requirements. Or how the apartment sector would even continue to operate when subsidies end regarding the plight of those needing affordable housing. Here, we can help speed up the discussion: it can’t. When you build and rent apartments that cost $1,000 per month and the government has to pay $800 of that rent, or kick-starts the construction with tax credits and other subsidies, you’ve done nothing to solve affordable housing, but merely enriched apartment developers and owners. Hiding from this basic truth has to end and the focus must be on housing types that are non-subsidized and still give people a nice place to live at a low cost: mobile home parks. Nobody can argue that it’s wrong to ensure that consumers have safe and viable home installation guidelines. But some of the new requirements in many states are simply tacking on $5,000 to $10,000 to the home price (which is up to a third in many markets) without any tangible benefit that even remotely meets these costs. Pouring slabs under homes may keep the home from settling at as quickly a pace which requires re-levelling, but the cost of re-levelling is only $250 in many markets, and the net benefit of that slab means you’ve spent $10,000 to save maybe $500 over a ten-year period. Consumers need low-cost places to live and it makes no sense to tack on hugely expensive site preparation and anchoring that ruins the affordability quotient. In addition, there are currently home installation options that are far less expensive and get the job done just as satisfactorily, and would allow the consumer to spend their money on more important items. We love the Duty to Serve initiative, but we’re not seeing it affecting the industry at this point nearly as strongly as it needs to. When we can see every mobile home purchaser with reasonable credit walk into a dealership and get approved to buy a new home, then we’ll be satisfied. There must be much more aggressive enactment of this great measure to truly help the millions of Americans that need it right now. It is very exciting to see so many initiatives lining up to benefit the manufactured housing industry. We support those that are positive, and believe that the negative ones can be overcome going forward with sensible thought and necessity. We’ve been the proud owners of many properties with great locations but terrible names. Some names are bad because they were “cool” a half-century ago (like Trailer Town and Roll-A-Home) and others hae a terrible association that come with them because of the poor management and resident screening that has gone on for decades. So what do you do when the name of the community you are purchasing is just plain awful or has a negative stigma? What is your single strongest selling point? In most properties, there is one single item that makes your property the most attractive to potential residents. Maybe it’s the school district, or possible the town name. 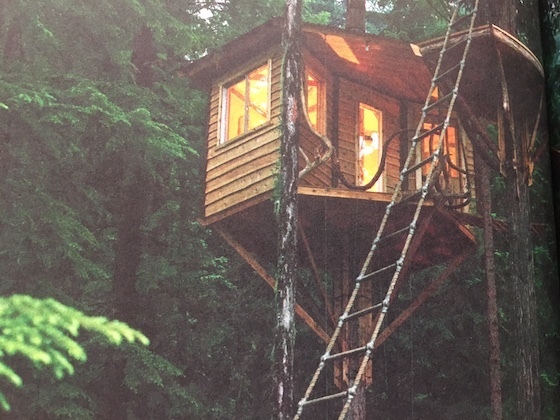 Maybe it’s the large trees or the scenic view. Whatever that single most-appealing item is, that needs to be your name. In effect, you have made the name into your strongest selling point, and your name is now an advertisement and a reinforcing moment each time the resident pulls in the gate. Moore Estates was named after the Moore school district, which is one of the best in Oklahoma City. Think about what the strongest selling point about your community is, and make that your name. Does the city have a problem with the change? Before you run down and start having a new sign made, you better talk to city hall. They may have a problem with your new concept. In most cases, they won’t, as they probably already think the name is bad and have been waiting for a new handle for the property. But it’s also possible that they have some ordinance or rule that might stop the name change (after all, this is 2017). Get their permission before you do anything. Does the legal system have a problem with the change? If the city is fine with the change, then you need to also consult your attorney to make sure that the name is not already registered by another mobile home park. You will probably be making the change via a dba, so take the correct channels to make sure that you are not creating legal liability for yourself. This is a fast and relatively inexpensive search if you have the right lawyer. 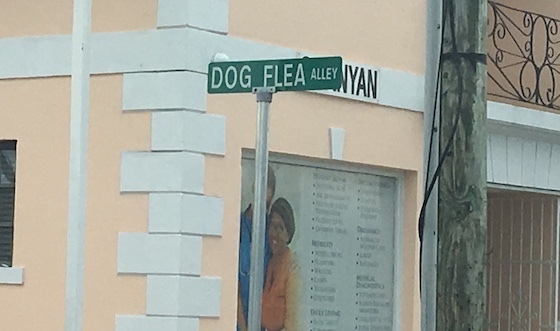 Street names are an entirely different business than changing the name of the property. Due to 911 record bases, it is virtually impossible to simply change the name of any street – even ones on private property. If a resident calls for an ambulance at 25 Big Oak Lane – and the 911 maps show that street as Trailerville Lane – then it’s a huge problem. You may have to simply suffice with a new community name but maintaining the old street names. All manufactured home communities deserve a good name – one that the residents can be proud of. Convert bad names into good by selecting the strongest sales point, and make sure to follow the legal process. Choose a name that you can be proud to own, and your residents to live in. Our regional manager for Texas is Aimee Kimberling, and she has been nominated as a Community Representative for the Texas Manufactured Housing Board. We are excited about having a voice in TMHA affairs, as they are a great group and we think we can get a lot accomplished. Remember that the TMHA was instrumental in the recent passage of the new law that forbids a city from trying to block any attempt to fill a “grandfathered” vacant mobile home park lot. These type of initiatives are essential for the advancement of the mobile home park owner’s rights and ability to operate their business for maximum value. We urge you, if you are a member of the TMHA, to vote for Aimee Kimberling.